As a class project we made a graph comparing four different pecan pie recipes. We charted all of the ingredients and created our own pie recipe using the ingredients we thought would make the best pecan pie. Two different pies were baked, one using a compared recipe and one using our created recipe. We passed out samples to the teachers and Shyla's Pecan Pie won with everyone! 17 pies were ordered by teachers for them to take to their own Thanksgiving dinners. 1. Melt the butter in the microwave in the class measuring cup. 2. Mix eggs, corn syrup, sugar, butter and vanilla in mixing bowl using hand mixer until well blended. 3. Sprinkle pecans on top of the pie filling. 4. Pour the pecan pie filling into the shell. 5. Place foil around edge of crust. 6. Bake for 20 minutes at 350F degrees (180C); in convection oven. Remove foil, and continue to bake for 10 to 15 minutes. ***6. Bake at 350F (180C); 50 - 60 minutes in preheated conventional oven. Removing foil halfway through cooking. Yum can't wait to try this. Wow I can wait to try this, I'll make it for Christmas - fantastic, sounds sooooooo yummmmmy! We have decided to change our family recipe and use yours every Thanksgiving. It was so good~ I barely was able to try it before it was all gone! 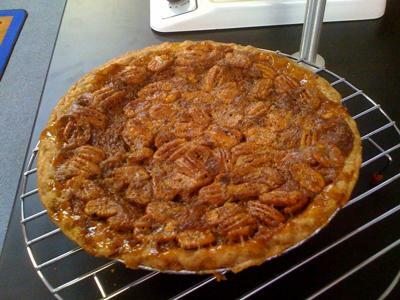 This pecan pie reminds me of the one my Grandmother used to make every year! That's why I had to buy an extra one! I served it to everyone who came for Thanksgiving and they all thought it was delicious! It was a big hit! Thanks for the great recipe and pie! You did a wonderful job! The pie was so good all my kids loved it, and no it did not make it to Thanksgiving. As soon as I got it home we cut into it. It was great and everyone wanted the last piece! Wow Shyla, you are awesome and that pecan pie was great! Uncle Stephen ate a HUGE piece and Jack and his Dad ate more! I had to grab a piece and run and hide before they got mine! You did a fantastic job! When are you going to make some more? Your pie was absolutely delicious! Enjoyed every mouthful! I sure wish I would have been here to order a pie from you. I took Mrs. Gossett's pie to her. It really looked yummy, I was tempted to taste it. You did a real fine job. Wow!!! What a pie!!! Shyla's pecan pie was a tasty delight at our table on Thanksgiving day. I am so proud of you and your hard work. Looking forward to Christmas. Hope you are cooking again. Shyla, I got a sample of your pecan pie and it was delicious. You can cook for me anytime. Your pie was simply yummy. I can't wait til Thanksgiving day. I'm taking it to share with my family. I am so proud of you and all your hard work! 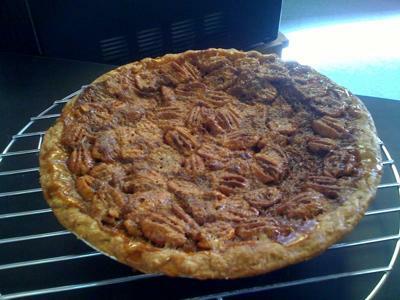 What an awesome pecan pie....and created by a ten year old! I can't believe you baked 19 of these great pies! I know a lot of teachers and their families will be enjoying them tomorrow! Shyla you have done a great job on these pies. my family will love it. Hip Hip Hooray for Shyla! !